We originally found this recipe on foodnetwork.com, here…, but adapted it so that it was more clear, and more frugal….no real lobster fits into our budget…at least not these days! We served these with brussel sprouts, lightly boiled and then sautéed in butter and lemon juice. YUMmy dinner. Preheat oven to 350 degrees F. If phyllo is frozen, make sure to completely defrost it before handling it (read box for instruction on this). Once removed from package, you will need to cover phyllo with waxed paper and a damp towel to prevent it from drying out. 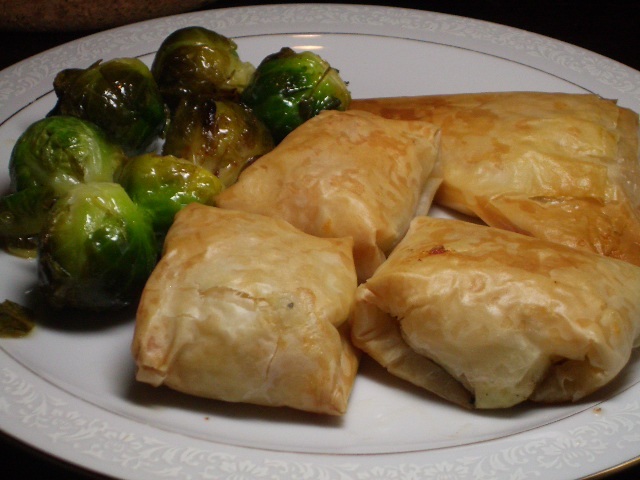 Remove 1 phyllo sheet from under the wax paper/damp towel (you want to make 1 complete pillow at a time…). Lay it out on a cutting board/clean surface and (lightly, gently) brush on a layer of melted butter. Fold in half, brush with butter again, fold in half again, brush again, and fold again. (Each dough sheet should yield 1 rectangle, roughly 3 by 5 inches, so you will have 12 “pillows.”) In a mixing bowl, combine the lobster, cheese, and parsley and season with salt and pepper. Place a small mound of this mixture on the 1 rectangle of dough. Fold the sides up and over each other to form a smaller square packet, brushing a touch of butter after each fold to hold it all together. Lay each pillow on a cookie sheet sprayed with cooking spray. When all pillows are complete, brush a touch of butter on top of each pillow (for good measure! ), and place in the oven until all are golden brown (about 15 minutes). *As you may have noticed in the first picture, we also attempted triangle shapes…and wouldn’t recommend it. 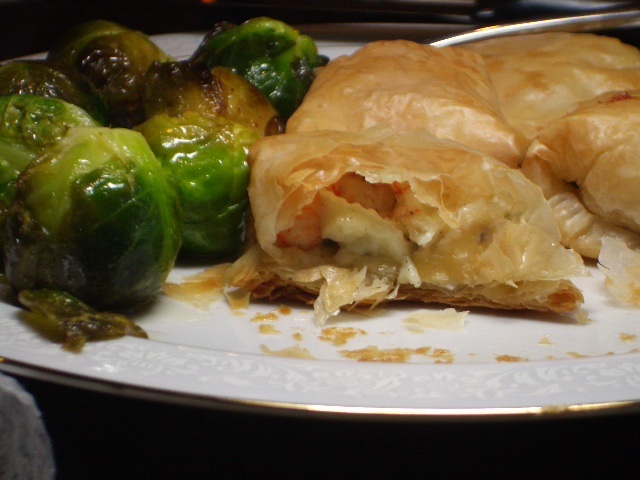 It leaves two bites of only phyllo (the corners) and maybe 1 bite of good stuff….instead, opt for pillows. They are easier to fold anyway! wow! i thought i was being brave buying frozen shrimp at the store today! lobster pillows?! For some reason, “phyllo pillows” makes me laugh out loud.